Dust Girl by Sarah Zettel. Book One in The American Fairy Trilogy. Review: Suspenseful, mysterious, and chilling describe the plot of a both freaky and amazing story about a girl. But she's not any ordinary girl; she is part fairy. In the story Dust Girl, by Sarah Zettel, Callie LeRoux goes on many wild and crazy adventures! Callie and her mother live in a town called Dust Bowl. It is exactly as it sounds. There are dust storms going through there constantly! Her mother is convinced that the man Callie believes is her father is coming for them but Callie knows he will not. Her mother begins to go crazy and then Callie feels like she is going crazy too! She is hearing voices inside her head. ÒThere she isssss.Ó Suddenly, there is a terrible storm and Callie's mother goes missing. She puts her hope in a mysterious man who gives her some clues. Callie befriends a boy and they go on a quest to find her mother. She finds out that she has a unique power that the Warring Fairy factions are trying to take from her. What is she going to do? I love this book! I would not recommend it to anybody under the age of 10. There are some creepy parts in it that might give kids nightmares but if you really like creepy books then I definitely recommend this! Dust Girl has an incredible beginning! A lot of books have slow beginnings but as soon as I picked this book up I could not put it down! It begins with a very interesting part, saying, ÒOnce upon a time, I was a girl called Callie. That, however, ended on Sunday, April 14, 1935. That was the day the worst dust storm ever recorded blew across Kansas. That was the day Mama vanished.Ó Every time I read that part I get chills running down my spine! 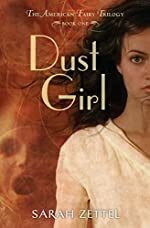 If this kind of book sounds interesting to you then you should definitely read the book Dust Girl by Sarah Zettel. This is the first book in the American Fairy Trilogy series. Sarah Zettel is an amazing author! Review written by Lilia (6th grade student).